The Bedrock Blog: THE SECRET OF JE VALLEY XVII: MERCY IS FOR THE WEAK? THE SECRET OF JE VALLEY XVII: MERCY IS FOR THE WEAK? This campaign is set ten years after a previous set of adventures (HERE). This is the seventeenth session of the current campaign (Session XVI can be found HERE). It was an interim session conducted online. Last session the party snuck into General Dee's residence in Yuzhing to destroy the heart boxes of emperor's martial experts (which would kill them). However it was a trap and the heart boxes were fake. Led there by Shan Lushan, head of Zhaoze sect, they were attacked by paper shadows as a gate fell to trap them in place. The party fought its way out and burned down a section of the building in the process. They also seemed to kill Shan Lushan. They went back to their ship and regrouped. 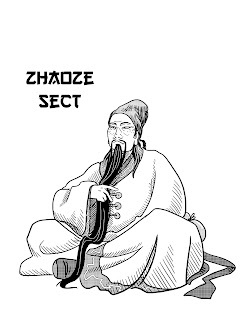 Kang found a small outpost of the Red Claw gang at a lacquered goods shop and learned that the general had had several meetings in the last few days with the leader of the Qui Pan Bandits, Zhang Wan (who came to the city with a large retinue). 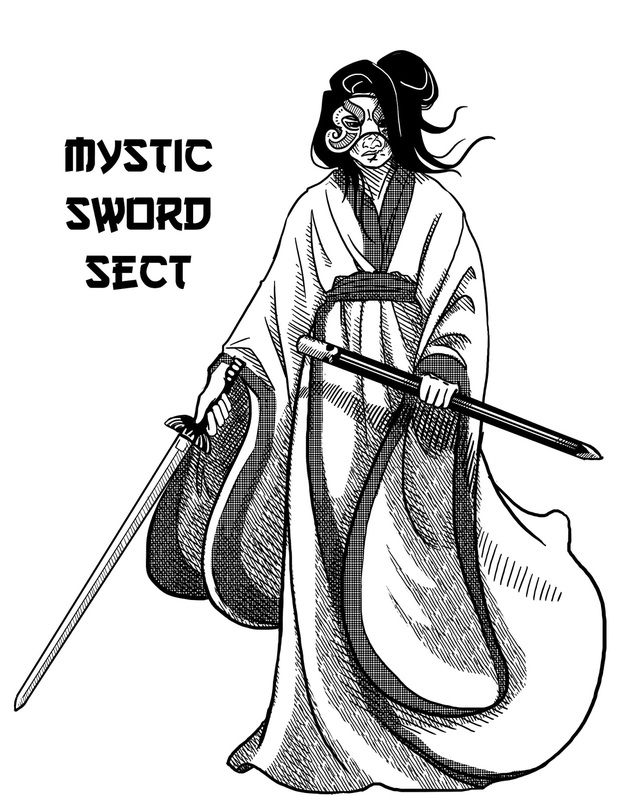 He learned that the leader was staying at the Towering Chrysanthemum and had several Flying Phantoms with him (a group the party believed had been eradicated with the destruction of Mystic Sword Sectt). He also learned that the Zhang Wan was meeting with the General again in the morning. Kang returned to the ship and reprimanded his disciple, Nuan (who was a former Flying Phantom herself). She had told him the Flying Phantoms were no more, and asked for an explanation. Juan convinced him that she had truly through they were destroyed so he sent her to spy on the bandit leader at the Towering Chrysanthemum. She returned, confirming at least 100 bandits, a robed figure, an Abbot of some sort and the presence of 10 Flying Phantoms. The party sent Zhi Zhu to spy on the Zhang Wan's meeting with the General. It was difficult to find a place to sneak into, but she settled on a crawl space beneath the floor (which was accessibly because of the fire). Over the course of the meeting she was struck by the cruelty of both the general and the bandit leader (each boasting about recent kills). The two met for over two hours, enjoying a meal. Zhang Wan commented on the state of the building when he arrived, but the general assured him the heart boxes were safe in Fan. Though Zhi Zhu could not see what was happening, she heard the General say "The object is being protected at Red Mountain Villa, but I have a way inside. It is the will of heaven that these enter into your hands...have a safe journey to west." Believing the object to be the Phoenix Crown of Bao (which she had give to the Immortals of Red Mountain Villa) Zhi Zhu returned to the ship and informed the party of the exchange. They decided that they had to eradicate the Zhang Wan before he could go west (believing he planned to reclaim the Phoenix Crown) and then immediately go North to Fan to destroy the heart boxes. The only problem was the size of the Zhang Wan's retinue. They had Nuan carve a message onto the pillar of the Towering Chrysanthemum, in a code only known to the Mystic Sword Sect, making it seem like Lady White Blade had returned as a spirit demanding the remaining Flying Phantoms give up the secular world and become nuns on Mount Hai'an or face her wrath. This was an effective technique as the Flying Phantoms live in constant fear of Lady White Blade and vengeful spirits are a reality of the setting. Eight of the Flying Phantoms left suddenly upon seeing the markings, not wanting to take any chances, while two remained with Zhang Wan. Meanwhile Kang went back to his Red Claw contact and obtained ten thunderbolt balls (Basically bombs). They also secured a smaller boat and readied to leave as soon as Zhang Wan boarded his ship. Zhi Zhu stood watch on the docks. When Zhang Wan arrived he looked angry and had only two Flying Phantoms. He was flanked by 100 bandits, the abbot but there was also a giant robed figure carrying a spear tip, and the party realized later that this was Zhang Kang, the Bandit King they encountered at Ogre Gate Inn (who was after them because they stole his Jade Horse). Zhang Kang was not a mortal man, he had been twisted into a terrible creature with horns and writing snakes for eyes. They set out on the river and kept about half a mile ahead of Zhang Wan. When they reached a wide point before the grand canal, they put their plan into action. Lingsu, Min and Rong each used Great Stride to take a Thunderbolt Ball to the mast of the ship. Then they each dropped them onto the deck, creating an enormous blast. Kang flew above the ship and dropped a Thunderbolt Ball, which exploded below the deck. The ship erupted into flames and started to sink, with the bandits all struggling to survive the water. Zhang Wan, Zhang Kang and Spear Tip, The Abbot and the Flying Phantoms leapt to the shore. Min used Great Stride to reach them, as did Lingsu and Rong. Nuan flew and carried Zhi Zhu, while Kang flew on his own. As Kang was heading toward the shore, the Iron Spear Tip whipped toward him and sliced his side. He tried to evade with Dip of the Drunken Snake but was still hit. Zhi Zhu unfurled her arms of Silk and managed to control the spear. With Nuan's help she moved it several hundred feet away from everyone else on one of the shores. There the spear tip escaped and attacked Zhi Zhu, but she used Turn of the Caltrop, which flicked the spear tip toward Zhang Kang. On the shore Min was met with Zhang Wan's gaze, which caused her bones to bend inside her body. This was excruciating and she unsheathed her Jian then attacked. She was able to slash Zhang Wan badly with Slicing Blade of the Flying Phantoms Technique and he stumbled back. The Abbot grabbed the bandit leader and fled into the air with him to the south. Lingsu used Great Stride to go after them. Nuan landed on the Shore and impaled Zhang Kang with her Ox Tail Dao. It didn't kill him, but hurt him a great deal. Zhi Zhu reached the fray and unleashed a hail of Storming Daggers on one of the Flying Phantoms, killing her instantly. Zhang Kang slammed Nuan with his fist, sending her back ten feet. Lingsu attached himself to the Abbot, hoping to force him to land. Abbot balled his fist and struck Lingsu in the mouth, inflicting a terrible blow and knocking out most of his teeth, save a few. Lingsu used Sword Whipping Strike and lacerated Zhang Wan. Kang use Tai Lan's Staff strike to batter Abboy, forcing him to release Wan and Lingsu (who plummeted to the ground after a brief tug of war). As they fell to the ground, Lingsu was able to twist Wan's body so it absorbed most of the impact and died. Nuan charged Zhang Kang and impaled him again, forcing him to his knees; Spear Tip immediately placed herself in-between Kang and the party, shaking in the air like an enraged hornet. Min used Swan Taming Strike to dispatch the other Phantom. Lingsu and Kang chased Abbot to the shore. As Spear Tip flew in a frenzy to protect him, Zhang Kang said "Mercy, show me mercy and I'll leave". Kang said "Mercy is for the weak." Then went to deal with Abbot. He struck with his staff and he dropped to surrender. Min was going to kill him to avenge Lingsu, but was persuaded to merely cut off his hands. There was an unease as the party decided what to do with Zhang Kang. They eventually decided to let him go with Spear Tip to the west.